Find device-specific support and online tools for your LG Stylo 2 V.
Get to know your new LG Stylo 2 V with this quick reference guide. To transfer/move/upload picture or video files between your LG Stylo 2 V and your computer/PC, view this info. Learn how to record a video using your LG Stylo 2 V.
An interactive guide for setting your LG Stylo 2 V to Airplane mode. 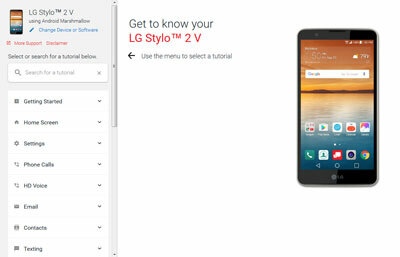 Learn how to forward an email on your LG Stylo 2 V.